Creative Day | Geek Girl Travels: The Letters of GeGi. For The Lips: Perfectly Pretty and Practical. Today’s original recipe can be found here, where a fellow blogger talks about coming up with a copy-cat recipe for Burt’s Bees lip balm and gives step-by-step directions. 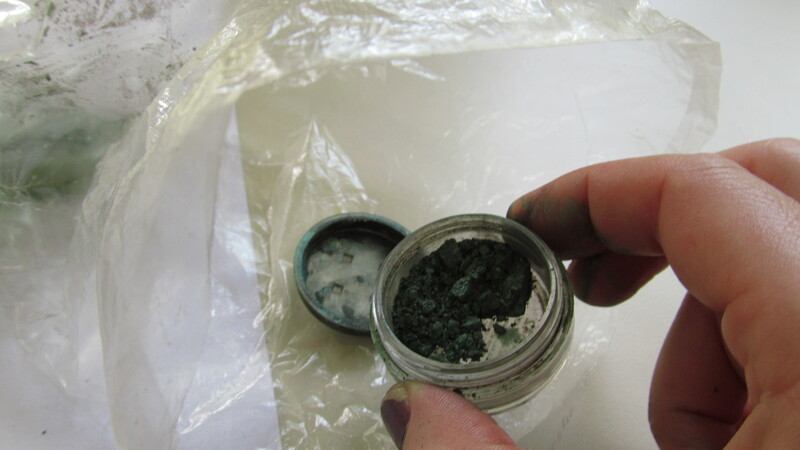 I’ve experimented twice with it now, and today’s post will be about the second attempt: using it as a base for a mica-powder-tinted lip balm. WARNING: THIS PROJECT WAS SUPER MESSY. This stuff hardens REALLY fast when you take it away from the heat of the double boiler, especially if you make it in small scaled-down batches like I did. Combine that with keeping multiple colors and containers separate, and you get, well, the picture above. Differences: I switched up the “flavors” of the essential oils to have a little variety; I skipped the E oil because I didn’t have any around; I added several different shades of mica powder (all of which had been labeled as “safe for lips”); I scaled down the recipe to make exactly the right amount for the number of containers I wanted. The mica powder adds a TON of shimmer in the container, but once it’s on your lips it basically looks like regular tinted lip balm. The pink one on the left doubles as a “hint of lip gloss” look without the stickiness of actual lip gloss, because it’s light enough you can’t see the color — just the shimmer. If I want more of a traditional lipstick look, I just add a couple extra layers and maybe some lip liner. Because I love the shiny and the 3-d lip look, I also add a light coat of loose mica powder (it can even be the matching color!) as a highlight. I don’t have any demo type pictures this post because I’ve yet to take a picture of my lips that I don’t feel is awkward and weird. Eyes, yes, but not lips. If you have any tips on how to do it, please leave them in a comment! Tomorrow may or may not have a make-up look. I haven’t taken one, and I don’t know if I’ll get around to it. I’ll be posting a post about posting soon, too; this month will have some alterations to the schedule, and I’m going to talk about why that is and what they’ll be. It’s DIY Friday! This time, I’m going to show off my homemade black eyeliner. Today’s post will be a little different from previous some DIY, because I’m not going to do a step-by-step how-to. 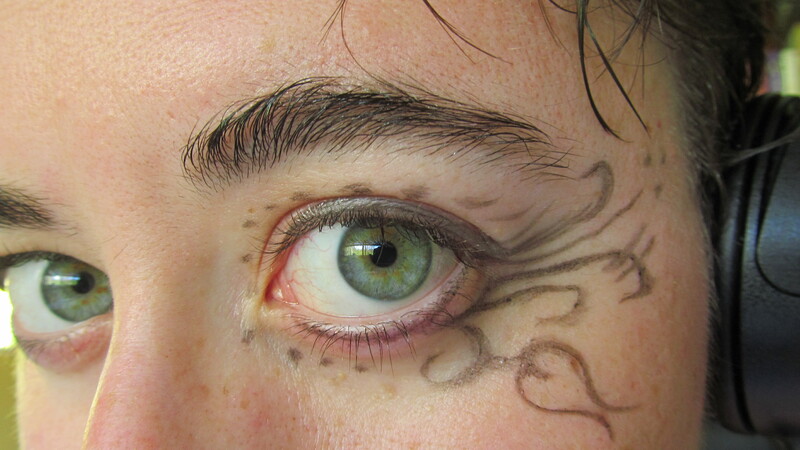 This is partly because (amazingly) I can actually give you the link to the original recipe I modified, and partly because I ended up taking a lot of pictures showing off several the ways this eyeliner can be used, and thought that might be more interesting. 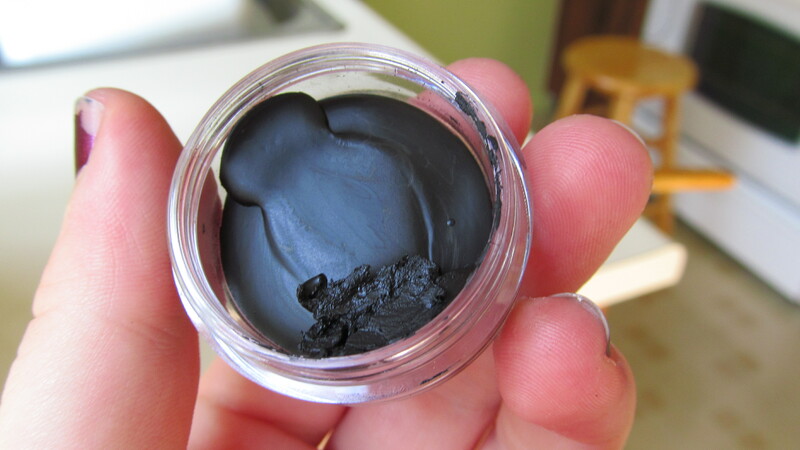 I was specifically looking to make an eyeliner that didn’t use activated charcoal for the color — very common in DIY recipes, I’ve found. I have nothing against using it, I just never have and didn’t have any around. However, I did have black iron oxide. I found this original recipe if you’re interested in trying it yourself. I basically just modified it for what ingredients I happened to actually have at the time. 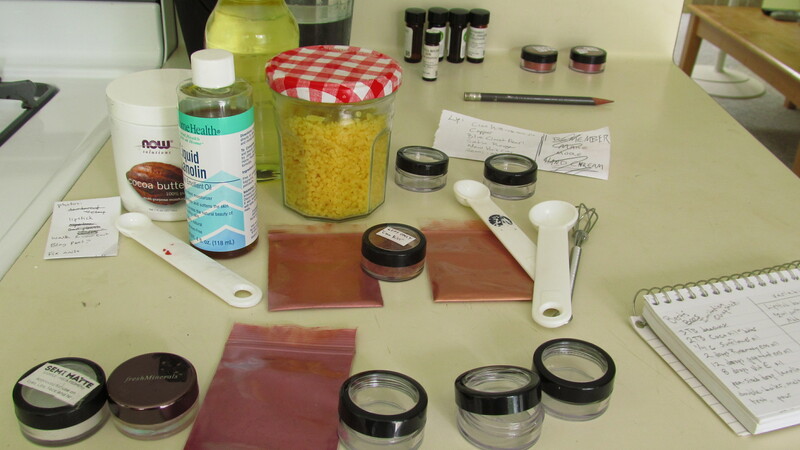 Those ingredients happened to be sunflower oil, beeswax, cocoa butter, clay, and of course, black iron oxide. Obviously, this means my eyeliner came out a little different than the original… But I still followed the same basic steps, melting and adding in the double-boiler. Very solid, and very black. I was a little worried about how well I could use it with my small detail brush (stolen from my oil painting brushes before it ever got used), since it was so very solid. But I was worried for nothing! Running the brush over the eyeliner several times quickly turns the bristles black, and it easily transfers to my skin. It looks like nothing is getting used because it takes very little to be effective — basically it means this tiny jar will last approximately forever. 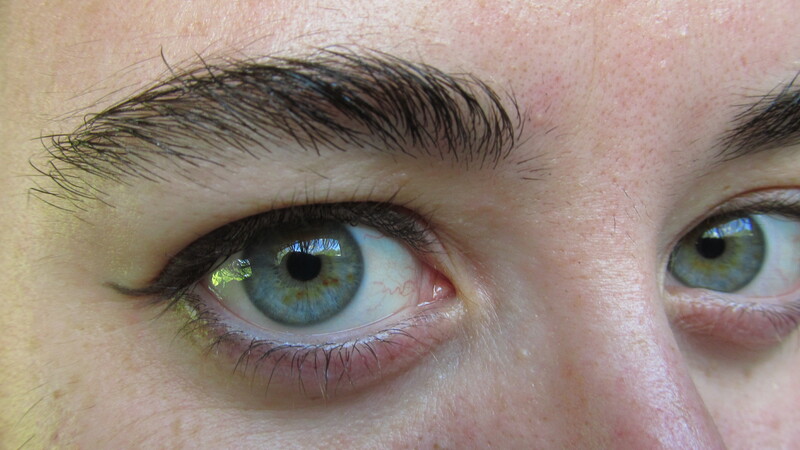 First up is my eye with nothing on, for comparison purposes. And then with a simple thin line, very basic. I LOVE how much control and precision the brush gives me, and the homemade eyeliner is very cooperative. 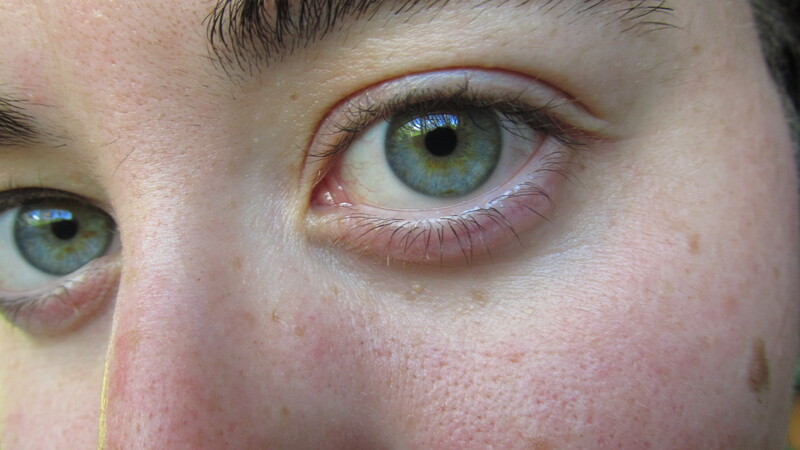 You can see there is just a little smudging onto the crease above my eye. I’ve yet to use ANY eyeliner that doesn’t do this if I put it on too thick (I put on quite a few layers to make sure it’d show up on the camera). With the homemade stuff, though, mistakes come off super easily and cleanly, while still lasting quite a while where I want it. I can’t say as much for every store-bought eyeliner! As mentioned, this cleans up very nicely! The beeswax base means it slides off super cleanly, with just a little warmth and/or oil to help if it gives you trouble. The classic, ever-popular, smudgy smokey eye. 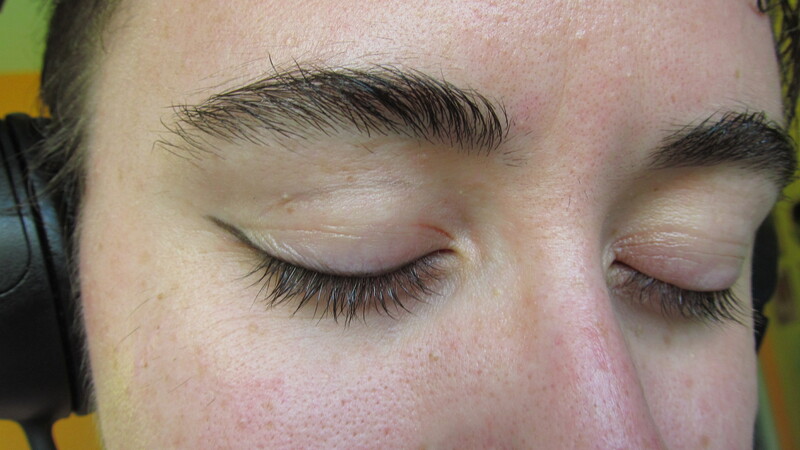 So there you have it: three quick and easy looks using only homemade eyeliner! Time for another home-made make-up look! Today’s eye makeup is daytime-friendly, that can easily transition to evening. 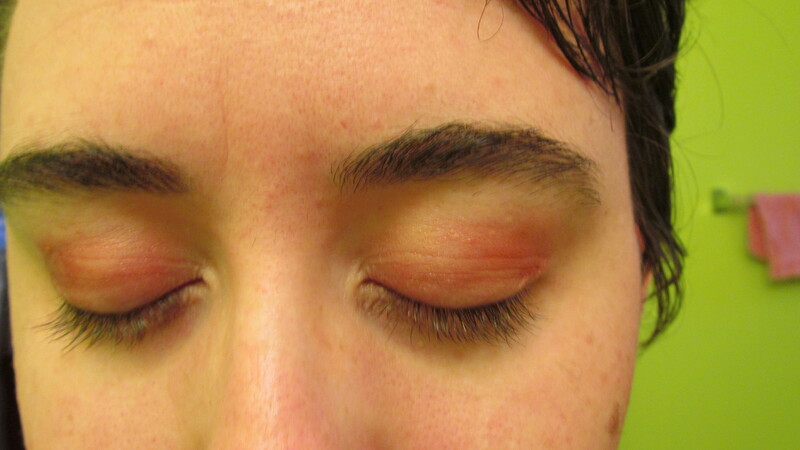 For this look, I started with a base of arrowroot/mica powder, applied with a blending brush. Then I took the darker shadow mix I created (from this post) and used a dome smudge brush to apply along the upper lid and slightly into the outer crease. I took a clean blending brush to smooth out the edges, and then used it to apply arrowroot/mica as a finishing powder along the underside of the eyebrows and the lower lid, blending it into the edges of the shadow. I took a detail liner brush, and applied a cream eyeshadow I made out of a dark purple mica powder (look for a future DYI Friday post on making that!) along and slightly beyond the outer edge of the lash line, top and bottom. This makeup wears well. I didn’t noticed the color migrating — like it did in last week’s look — until I teared up during a particularly feels-filled scene of a movie later in the evening. 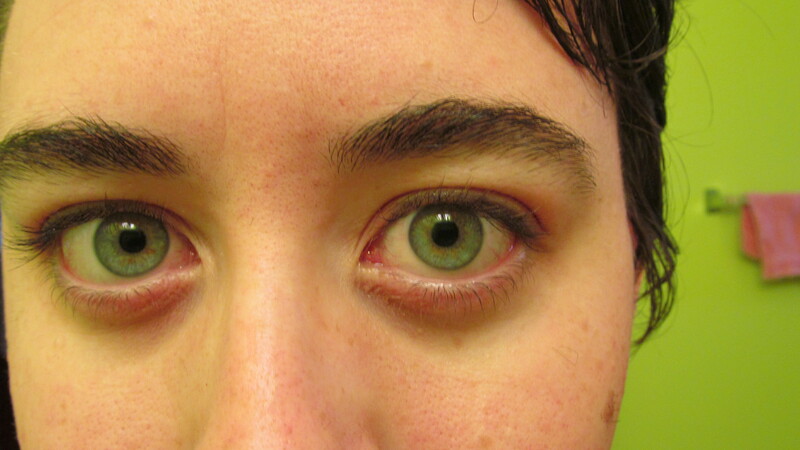 After that, the shadow was definitely heavier in the creases of the eyelid. But I find that an acceptable exception. We’ll see how much that happens with the powder base verses a cream base in future looks. Also, on the rest of my face, I’m wearing a homemade face cream, concealer, and finishing powder! Those will all get future blog posts as well. Taking a quick break from DIY makeup, let’s turn now to something even more important: deodorant. We can all agree that looking awesome is fun, but if you’re smelly no one is going to care how great your makeup is, right? 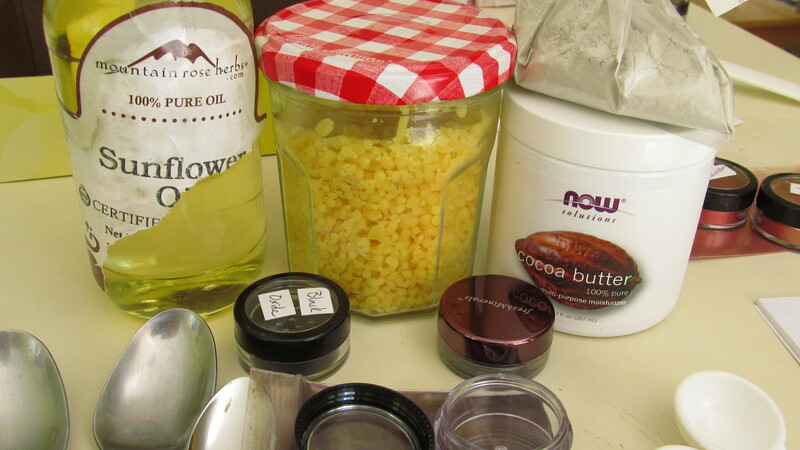 There’s lots of ideas out there for healthy, easy, DIY deodorants. It was one of the very first projects I got into, actually. I require two things from my deodorants: neutralize body odor, and keep the sweating to levels that won’t stain clothes. A little bit of sweat is normal and healthy — not to mention, pretty expected when living in the tropics — but I hate getting sweat stains on nice clothes, and too much sweat (except when exercising, of course!) just feels icky. Commercial deodorants are usually expensive, and full of nasty ingredients that can cause health issues in the future — not to mention it can be very difficult to find a scent you feel like smelling all the time. Health food stores and similar places usually have a selection of deodorants without the scary chemicals, but they also usually cost even more, and (for me, at least) aren’t as effective or long-lasting when it comes to the important things. Obviously, this was problem for DIY experimentation to solve! Any essential oils, especially antiseptics like Rosemary or Tea Tree (optional). Basically, you get 50-50 of arrowroot powder (look for it in the bulk, health food, or baking sections of your preferred store) and baking soda (make sure it’s aluminum-free), and blend them together. 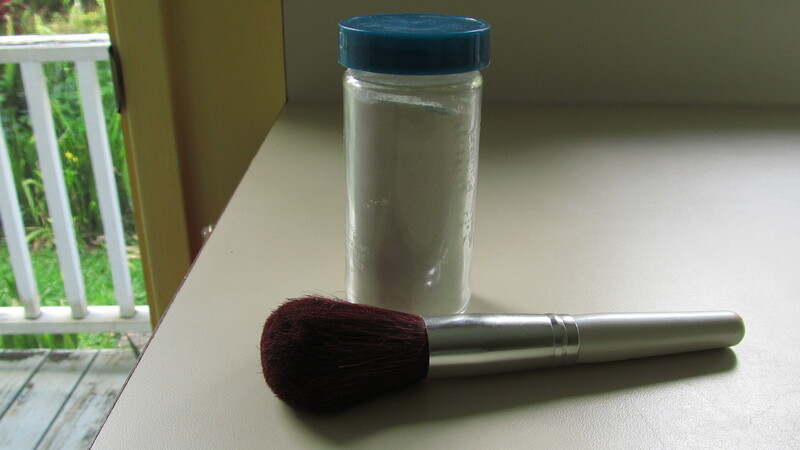 Put the resulting powder mix in a jar, get a large makeup brush for powder, and you’re all set! 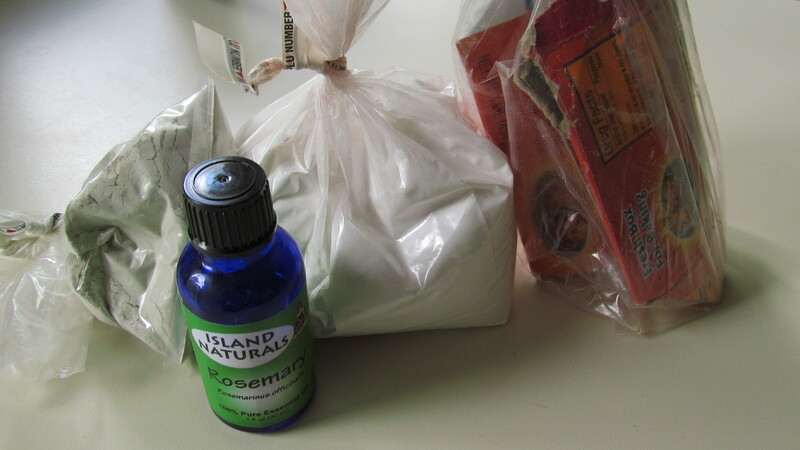 The baking soda works to neutralize odor, and the arrowroot adds smoothness and absorption. One application after a shower, and it lasts me all day! I started using this a year ago, and I’ve had zero problems with it. I don’t even sweat as much! I started adding clay and rosemary, just to try it out. I haven’t noticed a difference with the clay, which means I’ll probably keep adding it (a little less than the two main ingredients). In theory, it should help with absorption and perhaps even help draw out impurities. The rosemary (just a few drops, mixed in thoroughly) adds a very light, refreshing scent, and possibly a little of that bacteria-killing goodness. I keep it in a cleaned-out glass spice jar, and use a cheap foundation brush to apply. It’s easy to use: just tap the brush in the powder, tap off excess powder, and gently sweep it onto your underarms. It works with or without pit hair; either way, it does the job. Brush off any extra powder, and you’re good to go! Make sure you aren’t wearing your top when you do this, though, or you WILL have Mysterious White Powder problems. If you’re going to have an under-layer that won’t be seen, such as a bra, a binder, or a tank top, then it can awesome to put it on BEFORE applying, and letting a little of the extra powder get brushed into the cloth — it’ll help keep your shirt smelling just as fresh as you, even if it gets sweaty! I hope I’ve given you some ideas to try out yourself. Good personal hygiene is always worth having, especially when it can be so cheap, easy, healthy, and effective! As promised, here is my all-homemade make-up look! For the first official post, I went with something completely different: subtlety. 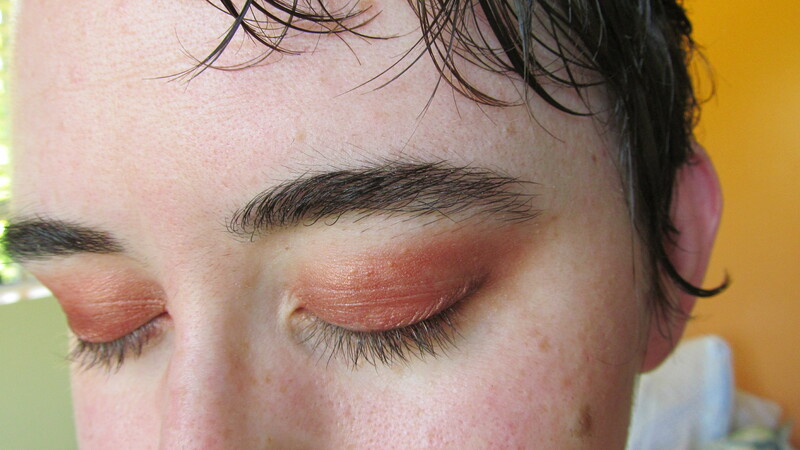 This is because I needed an eye make-up look I could wear to work, something very neutral. So I figured I’d share it with you all! I used a tinted cream as a base (keep your eye out for that future DIY post: tinted chapstick). 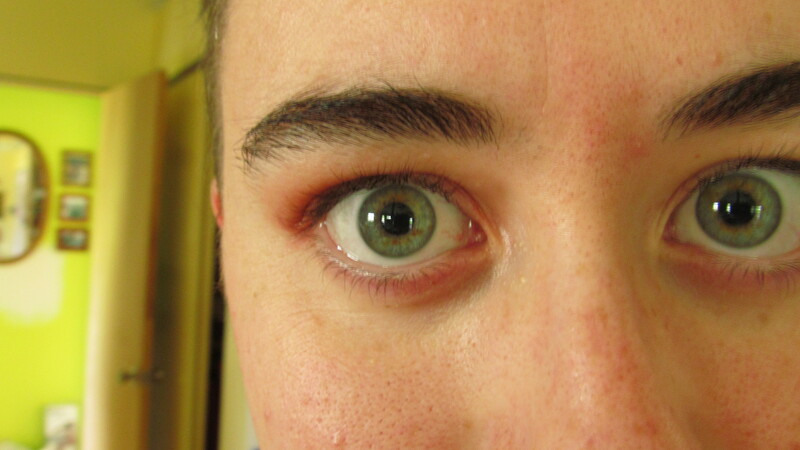 And a darker one (from this post last week) for the outer edge and crease. 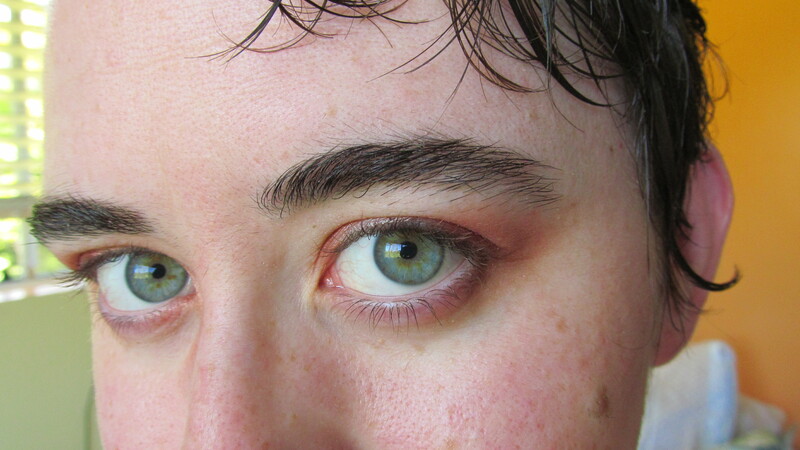 Then I used a detail brush to apply a thin coat of my black iron oxide eyeliner (also in a future post!) along the upper lash line. I used my arrowroot and mica mix — and another blending brush — to finish off under the eyebrows and the lower lid with some translucent brightness! 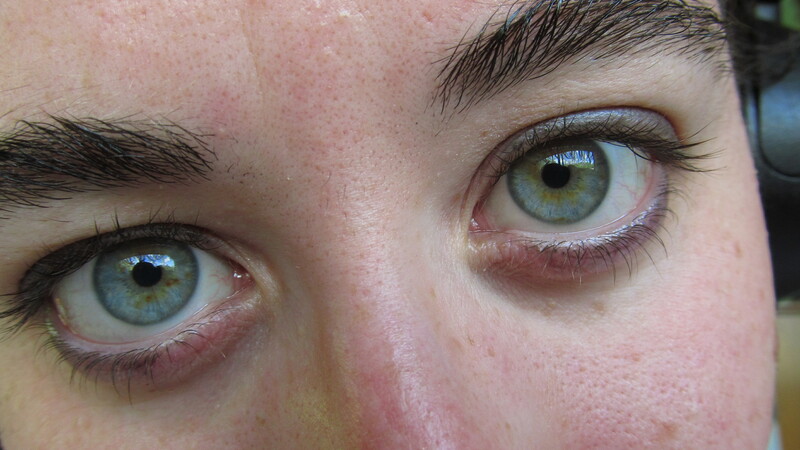 I also used a not-homemade mascara on the outer upper lashes, after I curled them (shh, don’t tell!). This look lasted through my work-day without any big issues. 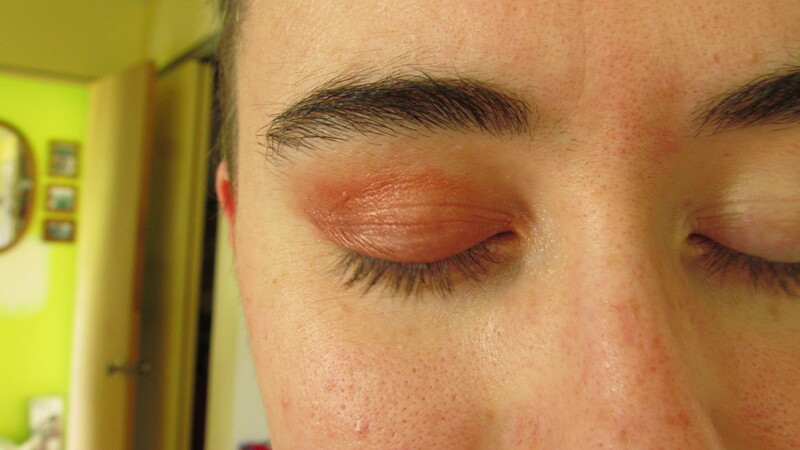 The color migrated a little bit to the folds of skin on the upper lids, but it was only noticeable when I closed my eyes, and the overall appearance was still good. Nail polish! Mica powder! ALL THE SHINY! 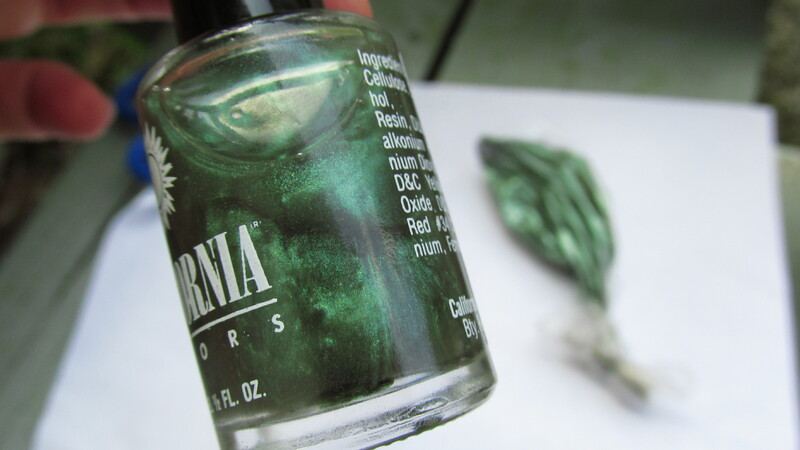 If you follow me on Twitter, then you might have seen a couple phone-photos I posted a while back showing off just how excited I was about combining mica powder with nail polish, and the shiny, shiny results. 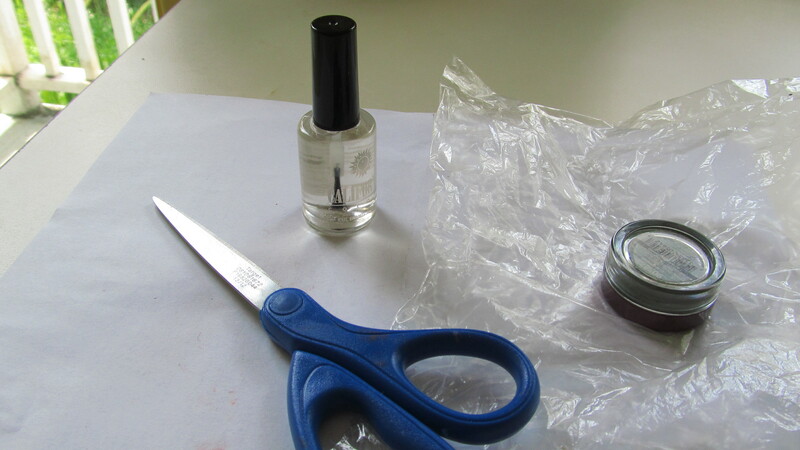 Now it’s time to tell you how I did it here on the blog, for my DIY Friday post. Couple of warnings, should you wish to attempt this yourself: mica powder is tiny and easily “poofed”, so take precautions to make sure you don’t breath any; this project is SUPER MESSY. Nail polish, clear or colored. Any powdered eyeshadow or mica powder. A piece of paper you don’t care about. 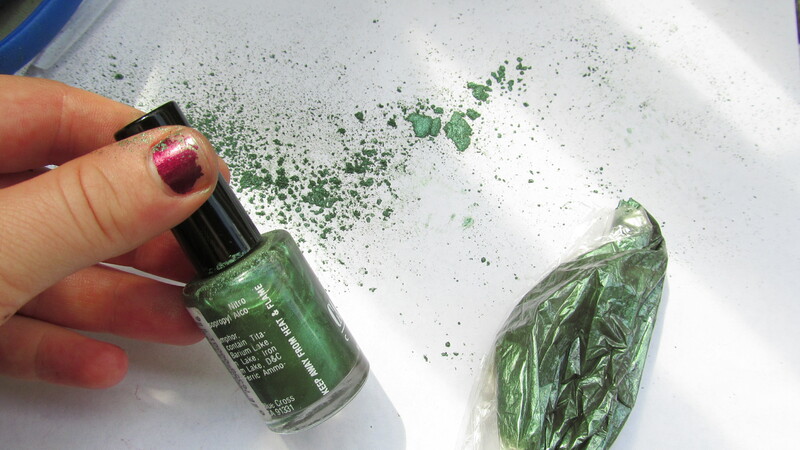 If you use clear polish, the color will be only from the powder. 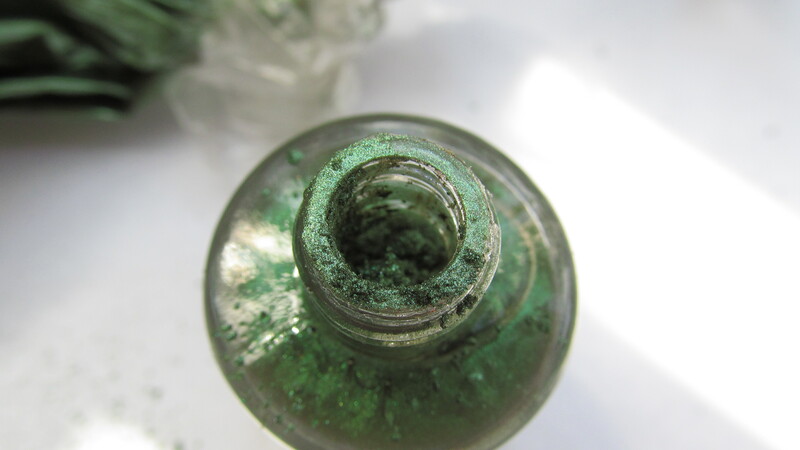 If you use colored polish, the powder will give it a new tint and add a LOT of sparkle-goodness. I’ve done both now, and LOVED both results. 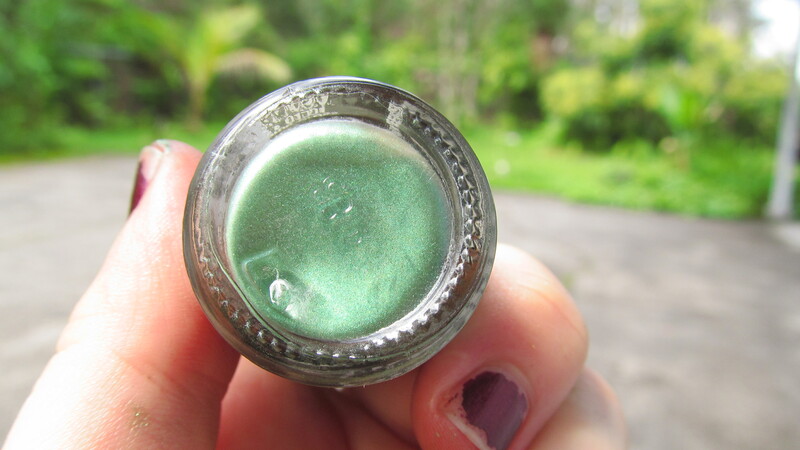 For this batch, I used clear polish with a green loose powdered eyeshadow that I never use on my eyes (because the color always came out too dark and muddy when I wore it). 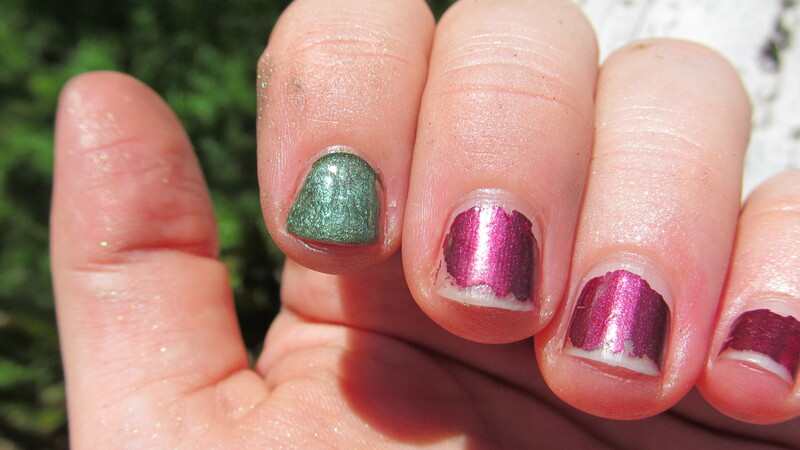 I figured a shiny green nail polish would get worn a lot more, and contrast nicely with whatever red/copper/pink shade I used with my eye make-up on any given day. Step One: Empty the powder into the bag. Try and dump it as much in one corner as you can. That will help later on. 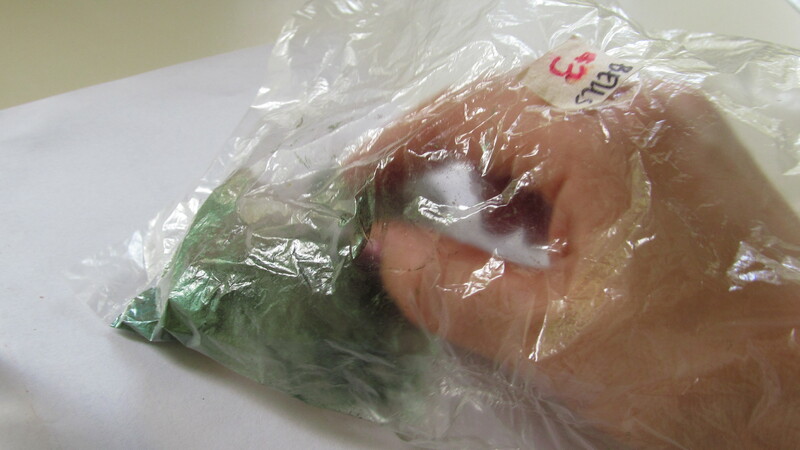 Step Two: Cut a small hole in the powder-filled corner of the bag with the scissors. Step Three: This part is gonna take practice. It’s also gonna get messy. 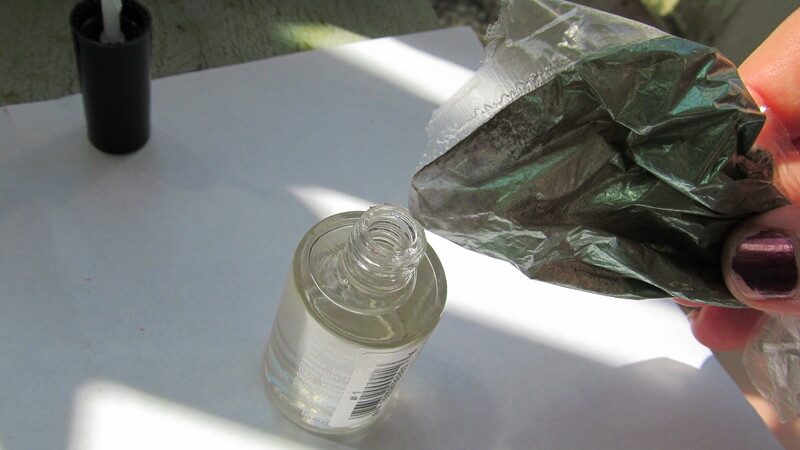 Using the hole in the bag as the small end of a funnel, try and get the powder into the bottle. You will want to stick the end of the bag slightly INTO the neck of the bottle — this was just out for the photo. Gentle tapping on the bag helps to get the powder down. You may need the tap the bottom of the bottle against the work-surface to settle the powder, as well, since it won’t mix into the polish yet. 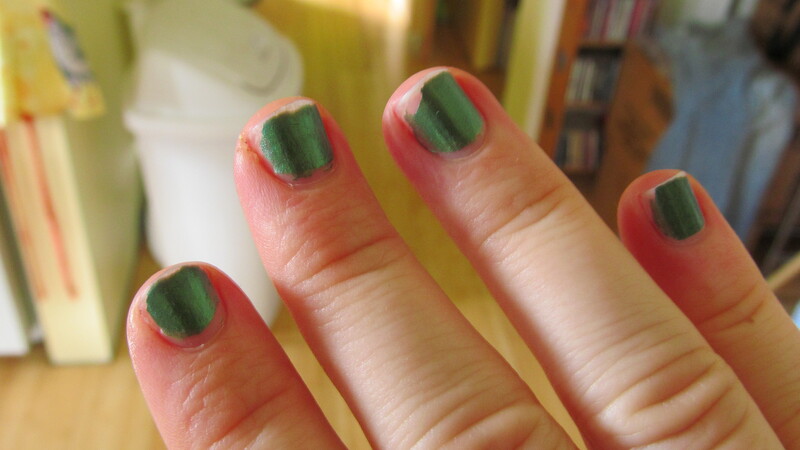 Or you could remove some the polish first to make more room — either way seems to work. 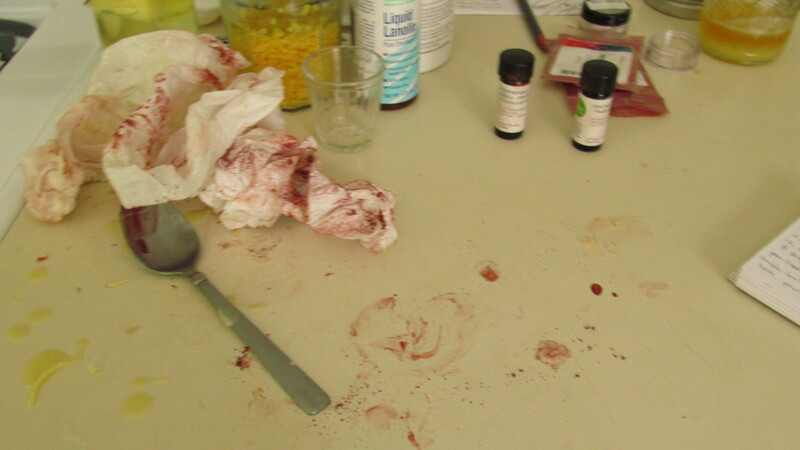 Step Four: Once the powder is in the bottle, close it up and shake. Then shake it more. And keep shaking. Admire the pretty swirls of color and glitter. Shake some more. Etc. You want to make sure everything is THOROUGHLY blended. So pretty! Now keep shaking…. There’s gonna be wasted powder, at least when you’re first getting used to this project. If that bothers you, find another project to use it on afterwards! DIY is fun, and there’s always more ideas to try. Just keep your work-space clean so you can safely gather and reuse the excess from each attempt. 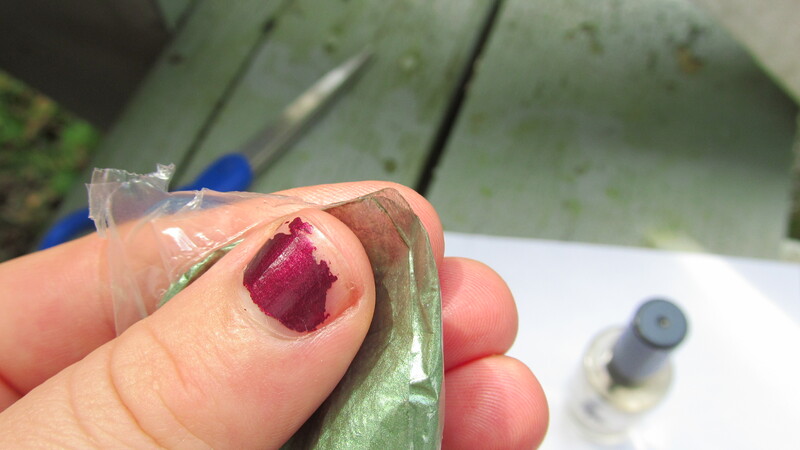 I tested it over the old nail polish (feeling lazy, and in a hurry). When I properly did my nails with it, I discovered that (surprise surprise) adding powder makes the polish dry quicker. Yet it’s also a little runnier while wet. Odd. And after working three or four days straight at my housekeeping job — not being particularly careful of my nails, and not wearing gloves for most of the tasks — I was quite happy to discover that the powder also seems to help with longevity. Even with no top-coat or base, check out how little chipping there is! Alright, that’s all this post. Check back tomorrow for an all-homemade make-up look! 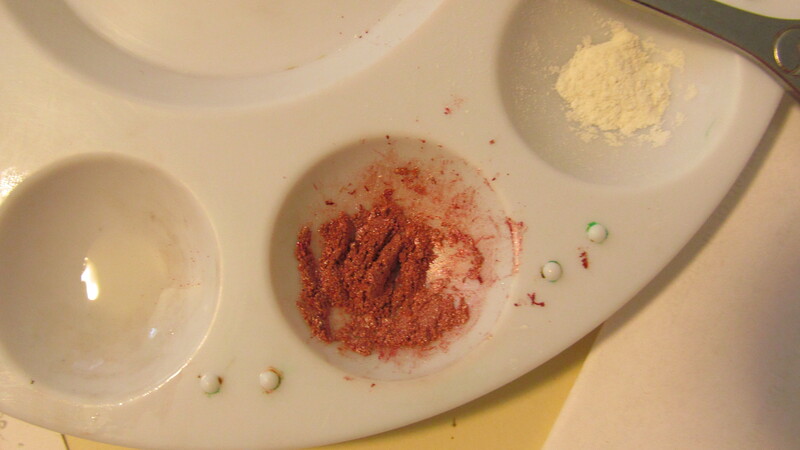 Last week I reviewed the new mica powders I just bought. 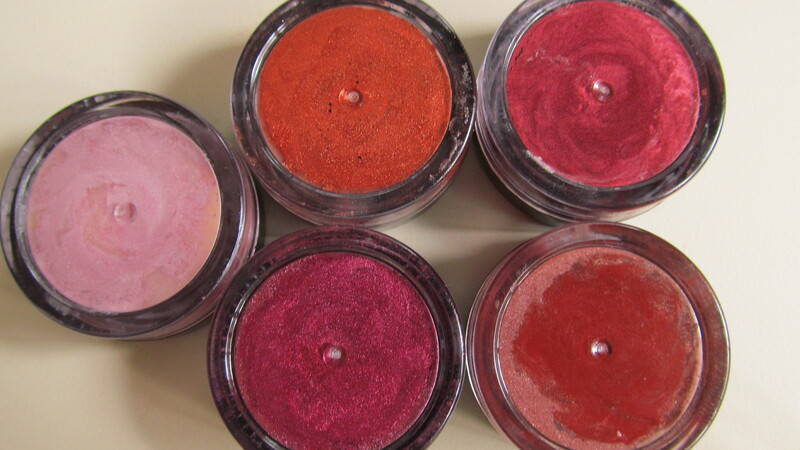 This week, I’ll show how I used them to come up with a new eyeshadow! If you use mica powders at home, remember this Pro Tip: breathing those tiny particles are bad for lungs — so please take proper precautions, and have fun! Since I don’t have a lot of extra money, instead of spending more on a make-up pallet for mixing colors, I re-purposed a plastic artist pallet I had around for painting and never used. I cleaned it thoroughly before using, of course. 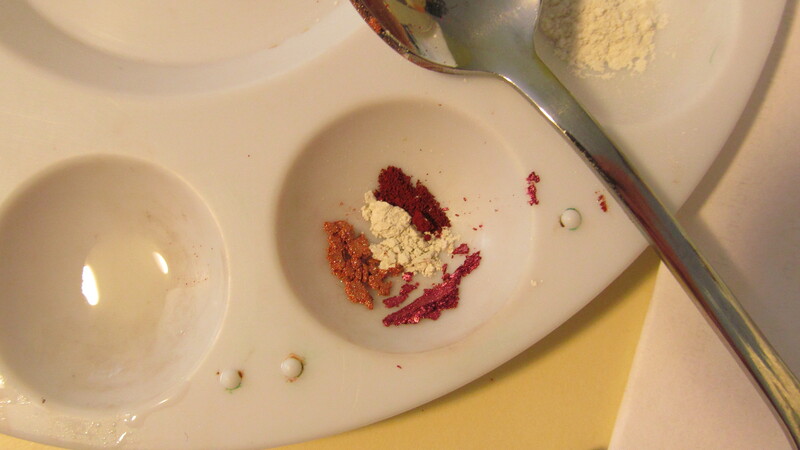 On the pallet, you can see I have nearly even proportions of four powders: Metallic Pearl Honey Tan (left), Cosmetic Iron Oxide Red (right), Blue Claret Pearl (bottom), and Semi-Matte plain mica (in the middle). This is what they looked like after careful mixing with the metal spoon — I recommend a lot of “chopping” style mixing to help de-clump the powders without stirring them up into the air much. I wanted to see what it looked like with a little more of the matte red, and also added some Copper. I mixed the result with arrowroot powder (which you can find in most health food stores — I recommend checking the bulk section). I’m using arrowroot as a filler for a number of reasons; I have it on hand, I know my skin doesn’t react to it, it’s fairly translucent on the skin so it won’t change the resulting color much, and it helps the mica powder go on smooth and stay longer. I made a primer with the Semi-Matte and arrowroot (half and half). 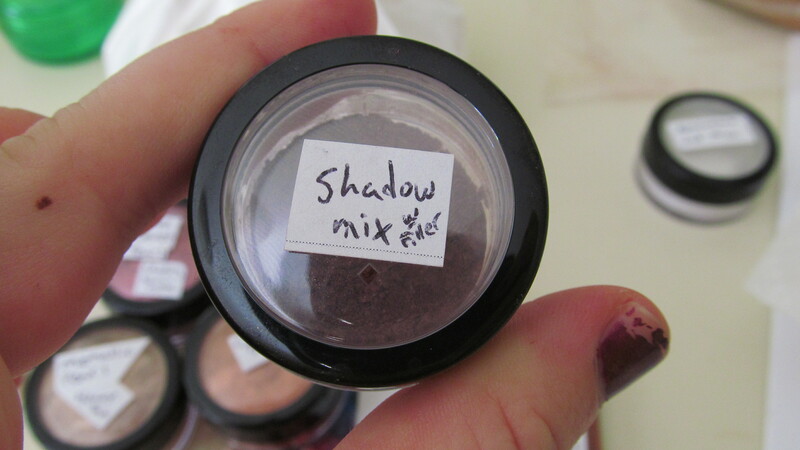 For premixed shadows I use a little less; experiment and see how much you like! I put the finished product in one of the ten oz jars with a sifter. Pro Tip #2: Make sure you ALWAYS label everything! I’ve got a lot more make-up and skin-care DIY projects to share with you, so come back every Friday for the latest product photos. As a bonus, I’m going to try and add a new make-up look created entirely from my homemade products each week as well, so keep your eye out for that on Saturdays! Also, I’m going to try and do a media review post (movies, tv, book, etc) every Monday, and a food (cooking, baking, whatever!) post every Wednesday. Check those out too, and enjoy!